The 2018 Sanganai Hlanganani World Tourism Expo was held in Bulawayo, Zimbabwe. The event attracted exhibitors and governmental representatives from African nations plus buyers and media from around the world. It proved a great opportunity to photograph portraits of attendees. Stands were ranged of the two halls at Bulawayo’s Zimbabwe International Exhibition Centre. The ZIEC is located close to the centre of Zimbabwe’s second city and covers a vast area. 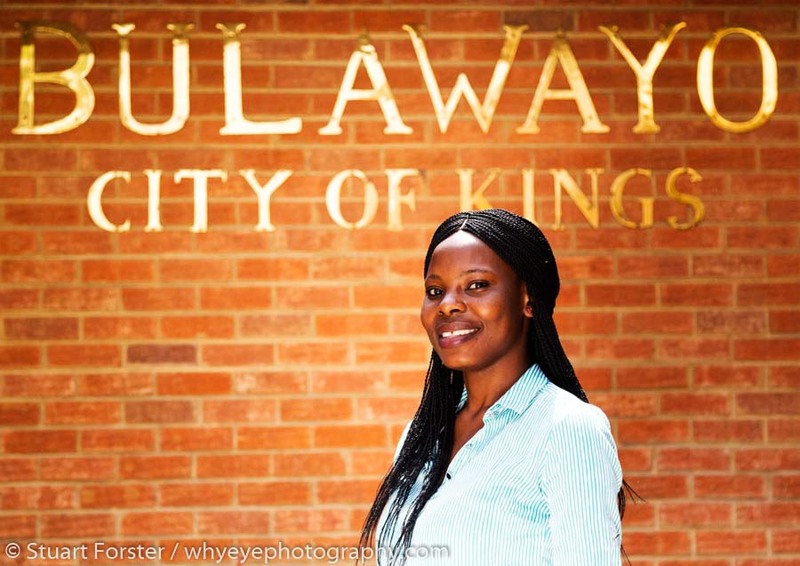 Woman by a ‘Bulawayo City of Kings’ sign. I travelled light to the ZIEC. I was using two Canon camera bodies with L Series lenses. My photographic objective was to capture portraits of people feeling comfortable in front of the camera. Many of the attendees wore tan safari suits and other forms of bushwear. Bushwear? That’s right. One of the objectives of the Sanganai Hlanganani World Tourism Expo is to promote tourism to game lodges in southern Africa. Inevitably, that means several of the exhibitors wore the clothing that they would also don on a day-to-day basis at their properties. This lady talked about tourism attractions in and around the City of Bulawayo. There were other attendees who preferred traditional business attire. Nice use of an accessory! Portrait of a man in a blue suit and scarf at the 2018 Sanganai Hlanganani Tourism Expo. One chap, wearing a blue business suit, also wore the multicoloured scarf of the ZANU-PF political party. Working through a series of poses. The nation’s newly elected president, Emmerson Mnangagwa, announced his cabinet while Sanganai Hlanganani was underway. The slogan ‘Zimbabwe is open for business’ was associated with his campaign. A lanyard wearing female attendee at the Sanganai Hlanganani Tourism Expo. There’s widespread optimism among people involved in the tourism industry that Zimbabwe is on the cusp of positive change. Many businesses in the sector are reporting a significant hike on bookings, year-on-year, during the first six months of 2018. In addition to people representing tourism related businesses and products, several manufacturers were present to showcase wares that could be of interest to travellers and visitors to Zimbabwe. Beyond bushwear and fashion items, I found it fascinating to chat to producers of traditional souvenirs and people recycling plastics and other items, including bottle tops, to make handbags and accessories. Portrait of a man at his craft stall at the Sanganai Hlanganani Tourism Expo. I chatted with Mary Filannino, the founder of Nnino Ceramics, about why she founded her business in Bulawayo. Mary Filannino of Nnino Ceramaics holding one of her designs. The region around Bulawayo is renowned for its traditional beadwork. Sanelisiwe was working at a stall selling handicrafts and wearing some of the colourful beads. She agree to be photographed and proved a natural in front of the camera. Sanelisiwe wearing traditional bead work at the Sanganai Hlanganani Tourism Expo. Violet was also wearing beadwork and an eye-catching red hat at the Soko Leather Craft stall. Violet in an eye-catching red hat at the Sanganai Hlanganani Tourism Expo. Photographing people at the Sanganai Hlanganani World Tourism Expo proved enjoyable and rewarding. I hope you like the selection of portrait photgraphs I’ve chosen to display on this page. If you’d like to commission a portrait photography session then please feel free to get in touch with me via the contact page of this website. Alternatively, call me on +44 7947 587136 to discuss your requirements and to arrange a session. I’m based in Sunderland, in the northeast of England, and able to travel to undertake commissions. Disclosure: I travelled to Zimbabwe as a guest of the Zimbabwe Tourism Authority with Rwandair. Rwandair flies between London Gatwick and Harare via Brussels and Rwandair’s Kigali hub. This entry was posted in People Photography and tagged Africa, People Photography, Portrait Photography, Zimbabwe. Love these portraits. I’ve been learning to take more pics of people on my travels too. It really brings the place to life. It certainly does. Enjoy your travel and people photography. Outstanding portrait pictures. I hope you are available for private commissions too? Yes, I am. Please call 07947 587136 to discuss your requirements. Fine work. I really like what you have done here. Congratulations on the quality of these fine portraits!